This romantic comedy thriller from 1929 (digitally restored for its Glasgow Film Festival and DVD premieres) competes with Hitchcock’s Blackmail for the title of first ever British talkie. 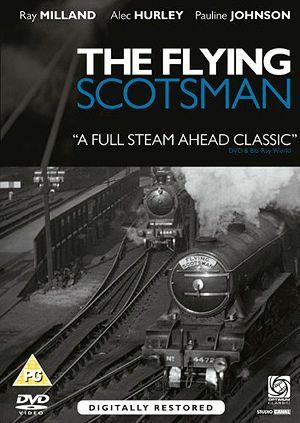 Like Blackmail, The Flying Scotsman (which was directed by the marvellously monikered Castleton Knight) started as a silent film and had dialogue added to it. As a result, it begins with captions and music and, rather disconcertingly, switches to dialogue a third of the way in. The change from visual to verbal-oriented filmmaking is fascinating, and, unsurprisingly, the former, more established style is far more accomplished. The film is also notable for being set aboard the eponymous steam locomotive that served the London to Edinburgh line and for the cast, which includes Ray Milland making his debut, performing some breathtaking stunts including clambering along the outside of the moving train. And what a thrill it is to see the famous train arriving at Waverley Station, on what looks like platform 11. No extras, which seems like a missed opportunity.